Excessive friction from dirt, carbon buildup, lack of lubrication, or burred parts usually causes sluggish or erratic action. Once the gunner realizes that the gun is operating sluggishly or erratically, he should cease-fire and clear the weapon. The two primary corrective actions are cleaning or turning the weapon into the armorer. There are several reasons why a weapon may exhibit sluggish or erratic firing. a. Dirty Bore or Chamber. A dirty bore or firing chamber can cause sluggish or erratic firing. Clear the weapon and clean its bore and chamber. Reload and continue with the exercise. b. Recoil Springs or Guide Rods. Clear the weapon and remove the bolt and backplate assembly from gun. Push against springs to test for weakness. Note bent rods. Report defect to armorer or support maintenance. c. Bolt Sear Timing Adjustment. Clear the weapon and turn it into direct support maintenance. A runaway weapon continues to fire after the trigger has been released. Worn parts or short recoil of the bolt assembly may cause a runaway gun. 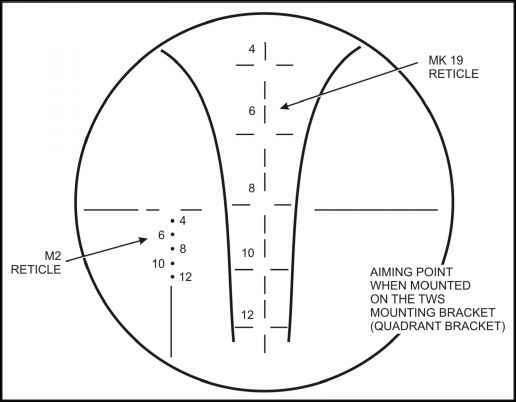 Consider the amount of ammunition left and the type of MK 19 mount used when determining the best way to stop the weapon. (1) If ammunition is not low and the MK 19 is used in the free gun mode, keep rounds on target until the all the rounds on the belt have been fired. (a) Keeps gun pointed downrange and slightly elevated. (b) Presses charger handle locks. (c) Lowers the charging handle(s) so the gun will stop firing.